The NASCAR folks used to call his old man Wild Bill because of his fearlessness steering through right spaces. Later they called him Million Dollar Bill because he was so good beating everybody else to the finish line. But the most popular nickname for Bill Elliott was Awesome Bill from Dawsonville. Not a bad way to go round and round those NASCAR tracks. Now his son is making a name for himself in the top level of the sport. At the age of 20, Chase Elliott has taken over the No. 24 car driven for a quarter-century for Hendrick Motor Sports by the legend Jeff Gordon, who retired after last season and now sits talking about his former colleagues with Darrell Waltrip and Mike Joy in the FOX TV booth. For the Big Daddy start of the 2016 NASCAR Sprint Cup season, Chase Elliott took that No. 24 car around that big track fastest of all drivers in the qualifying race to win the pole position. That means he started the Daytona 500 first. Which to my mind of course brought the thought that if he scooted out fast enough — which his track record of success, pun intended indicated he would — all the other drivers would be Chasing Chase for awhile. Alas, he led just three laps. And then on lap 18, he spun out and into the infield grass. That resulted in damage to the car that forced a return to the garage and kept him off the track until lap 40. 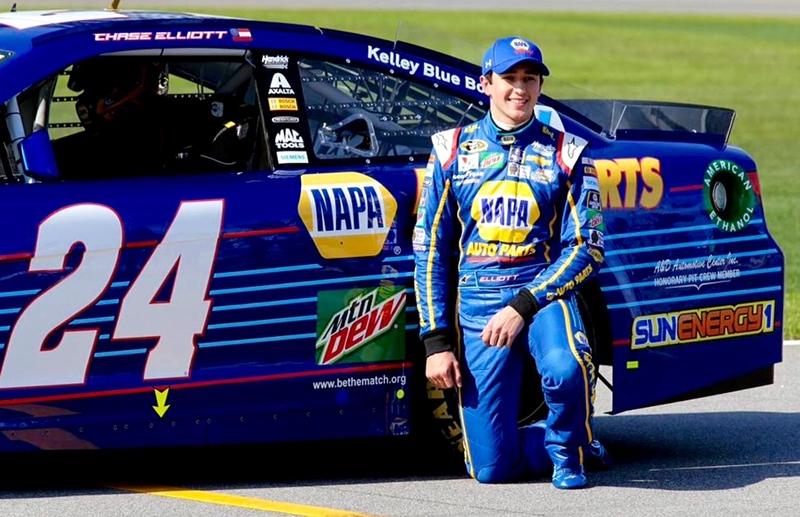 Young Chase Elliott, a five-time winner since 2014 on the NASCAR series one-step down including this year’s opener a day before the Daytona 500, finished 37th in the big one. But the most disappointing thing was the discovery that his real name is the same as his dad’s. William Clyde Elliott II is hardly as race-appropriate as Chase Elliott. And, hey, folks, he finished a very respectable eighth Sunday in Atlanta. Here’s the link for Chase Elliott’s WikiPedia page. Here’s the link for the bio page on Chase Elliot’s site. Here’s the link for Bill Elliott’s WikiPedia page. This entry was posted in funny names in sports and tagged Auto Racing, Bill Elliott, Chase Elliott, Daytona 500, nascar, Sprint Cup. Bookmark the permalink. And my favorite New York Knickerbocker of all time, Dave, Walt Clyde Frazier would agree with you, too. Clyde the Glide they called him on the court as the Knicks ruled when I was a kid. Yes!!!!! Clyde Frazier was the best defensive PG of all time, aside from my favorite basketball player ever, The Glove. Go Clyde! Clyde is pretty good, but Chase is very appropriate for racing! I like it. Movie director Robert Rodriguez actually named his son Racer, but I don’t think he’s in NASCAR yet. Awesome Bill from Dawsonville is the kind of name everyone would be proud of. Is there a movie with that title yet? While it seems weird to see the 24 car driven by anyone but Jeff Gordon, I think Chase has the perfect name for continuing #24’s racing tradition. It is so odd, also, seeing and hearing Jeff in the booth during the race, Tracy. How the world changes justlikethat. I dig your crash course on blurbery always, Diddy! Chase–another case of nominative determinism, even if it wasn’t technically from birth. I don’t know about names that are verbs. They are akin to names of occupations, like Guy Fieri’s sons, Hunter and Ryder, which also sound like commands. If that’s not community support, I don’t know what is. I only wish Texas had a Dawsonville. And as to Clyde–my great-grandpa was named Clyde, and I have a framed poster of him in the guest room, holding up a big fish he caught in the 1960s, sleek 60s car in the background. I’m not sure if I believe that story about your great-grandpa Clyde. Too bad you don’t have anywhere to post old pictures so that we can believe you…. It is a nickname for the ages, King Dave.